This is a picture I took yesterday. It shows the site of Camelot - in London. 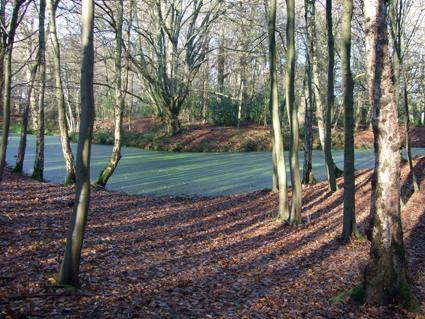 This wooded island now bears the name of Camlet Moat, and is within Trent Country Park, in Cockfosters, North London, but historical maps show that the area was once actually called Camelot. Amateur archaeologists claimed to have found the remains of a massive castle on the spot and the place has become associated with legends of King Arthur. I'd been wanting to visit Camlet Moat ever since I read Chris Street's Book, London's Camelot and the Secrets of the Grail, and yesterday I had my chance. I'll be writing more about what I found when I went there - and posting more photos - in a few days, but for now here is a picture of the view over London's Camelot on a bright and frosty winter morning.